A Tour de Force, by The Royal Court and the Represent programme. Which commission female orientated artworks exploring issues of democracy, inclusion and equality in contemporary Britain. This is a show like no other. Crisp and Cathartic. It’s a show where music, dance and spoken word collide. Right from the start we are physically drawn into the drama by the rhythm of the music … supplied throughout by an on stage DJ. Poet in da corner is essentially a coming of age story about Debris, a young, mixed race, Mormon-raised, bisexual. She’s a loner whose trying to find her place at home, at school and in the world. 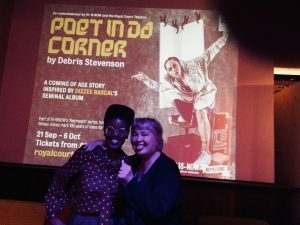 When Debris hears Dizzie Rascals seminal 2003 Grime Album ”Boy in the Corner” she has an epiphany, which enables her to feel confident about her own authenticity, to establish friendships and explore the potential of her life. The poetry is fast paced, funny, hard…sometimes, heart-rending. Its poetry that sings and dances…powered by the driving rhythm of the music. I particularly loved the scene where Debris experiences her first girl love. Which was tender, expressive and beautifully choreographed. The ensemble cast, play a number of parts throughout, with relaxed ease. The choreography, being an integral part of each characterization. It wasn’t just on stage that the dancing was happening. I went with Grime Pop Princess Toya Delazy and we, along with the rest of the audience, were dancing in our seats. It runs until the 6thOctober. I recommend you catch it if you can!